Is there such thing as “American cuisine”? This is the sort of question that can sustain long discussions over drinks and snacks among food studies folks or endless panels at conferences, like last year’s Slow Food Nations in Denver. Ruth Tobias provides an overview of the deliberations, more or less in time for the conference this year. One may quibble with the details here, the strange absence of the concept of “creole” foods, or even wonder why the existence of an American cuisine matters…but this is nevertheless an interesting read. While we are trying to associate societies and cultures with cuisines, this article, by Kyle Fitzpatrick at Eater.com, explores the existence of “queer food.” I have to admit, when I first started to read it I was skeptical. There are restaurants and bars frequented by LGBTQ people, of course, and certainly many LGBTQ cooks, chefs, etc. But how could there be something distinctive about the food? And yet, as a kind of holistic anthropological approach to a wide range of practices, ranging from the campy to kinship, from rituals to recipes, and much more, Fitzpatrick makes a convincing argument for Queer culinary culture. This is a very good essay and could be used effectively in all kinds of classes. Also, my colleague D’Lane Compton is cited. There may be trends in what people want to eat, but there are a lot of people, so keep in mind that a lot of them are not following the trends. That is one lesson we learn when David Brancaccio and Daniel Shin, of Marketplace, interview Jeff Harmening, the CEO of General Mills, about the way the corporation adapts to American food trends and tastes. This is fascinating. Harmening points out that rather than going in one direction—away from cereal for breakfast, for instance—American tastes go in a lot of different directions at once. Also, people still eat Lucky Charms for the marshmallows and still like Bugles. Bugles! Now that is something I have not had in a while. Meanwhile, the state of the world’s fisheries is clearly something that should concern us. In this article, Livia Albeck-Ripka explores the somewhat counter-intuitive impacts of climate change on the lobster fishery in Maine. Boom, then possibly bust. Terry Gross interviews Paul Greenberg, who has written a new book about the Omega-3 supplement industry, revealing some very disturbing facts about a variety of fisheries. The same Paul Greenberg comments here on the difficulties we face if we want to eat local seafood, pointing in particular to a recent scandal involving a company that purported to do just that. Finally, as Congress considers reauthorizing and amending fisheries legislation, Marcus Jacobs, a New Orleans chef, weighs in with some insights into the relationship between the management of fisheries and restaurants. The ongoing crackdown on immigration by the Trump administration has been having an especially severe impact on agriculture. Farmers are struggling in many places to find workers. In this article from Mother Jones, Maddie Oatman explores some of the current and potential impacts of these policies for wine makers in California. Mechanization is one possibility, although there are limits to how well that would work for smaller wine makers. Specific visa programs are also available, but the implications for workers and their families are shocking. Although much of the debate in the US has been about undocumented (“illegal”) immigrants, the deeper and more important question of managing immigration in general is made concrete in this article. As recently as the 1920s, 14% of American farmers were black. Today they make up less than 2% of the farming population. In this article from Vice, Lauren Rothman explores the history of government supported discrimination against black farmers. She also looks into organized efforts by black farm activists to turn this around. There was a great deal of surprise expressed last week when the U.S. used strong-arm tactics to try to modify or suppress a nonbinding resolution on breastfeeding that was being considered by the World Health Organization. In this article from the Atlantic, Olga Khazan explores the history of the cultural battle over advocating for breast milk. Industry advocates for formula play a role, but there are more complexities and a longer time frame then one might think. It is summertime and it is hot, so you probably need a refreshing drink. Perhaps a Tom Collins? It turns out that this classic cocktail is in fact named after a man…and his name was not Tom Collins. It is a surprising tale. To learn more, listen to the latest episode of the Drink & Learn podcast, which features drinks historian Elizabeth Pearce and bartender Abigail Gullo. Pearce writes drink history, but is also a cocktail-focused tour guide and speaker here in New Orleans. Gullo leads the bar at Compère Lapin, a wonderful restaurant, also in New Orleans. Last note, this one referring to what FoodAnthropology intends to read, but really has not read yet. The Southern Foodways Alliance suggests James Hannaham’s most recent novel, Delicious Foods (Little, Brown, and Company, 2015) as a summer read. To accompany that, they are going to publish a series of postings on their blog. Also, their fall symposium will have a focus on food and literature and Hannaham will speak there. Even if you are not planning on attending, this looks like a good read. Maybe we can get a food anthropologist to write something about the novel for us too. Did Feasting Promote Cooperation in the Ancient Andes? 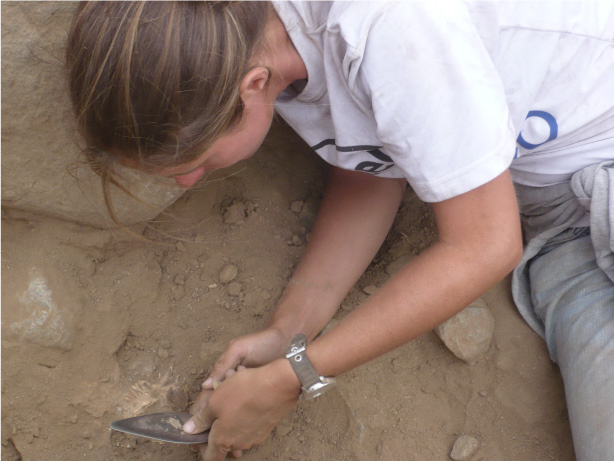 The author excavating a camelid jaw. Photo by Jordan Farfan. Since 2008, I have been studying the relationship between intergroup interaction and agricultural production on the Western slopes of the Peruvian Andes. One of the areas that my research highlights is the way in which food was key to political maneuvering that took place during this time period. The search for food was one of the driving forces behind pre-contact Andean geo-political maneuvering, particularly during the Late Intermediate Period (1100-1472 CE). The steepness of the Andean slopes creates stacked microclimates and each of these microclimates is suited to growing a different suite of crops. As such, Andean farmers had to maintain fields at various different elevations in order to add variety to their diets as well as to mitigate the risk of crop failure (see Murra 2002 for a complete explanation of this system). This movement up and down the Andean slopes in search of agricultural space led to a great deal of interaction between different cultural groups in different regions and the outcomes of these interactions sometimes often wide reaching impacts on regional geo-politics (c.f. Dillehay 1979; Rostworowski 1973; 1988). My research takes place in the Huanangue Valley, which runs through an ecotone known locally as the chaupiyunga. The chaupiyunga serves as the cultural and ecological boundary between the coast and the highlands. My data shows that the Huanangue Valley was the setting for intense sets of interaction between the coastal Chancay, highland Atavillos and local chaupiyungino groups, all of whom wanted access to the very limited, but very rich, agricultural lands which were ideal for growing highly valued crops such as maize, coca, chili peppers and fruit. In contrast to other regions of the Andes, where coastal and highland groups tended to come into violent conflict with each other over access to agricultural land, the different groups in the Huanangue Valley seem to coexist peacefully with each other. Based on preliminary excavation data, I am beginning to understand why. We know that the local chaupiyunginos controlled the uptakes for the irrigation canals which also allowed them to indirectly control agricultural production in the valley. As such, when the Chancay moved into chaupiyungino territory from the coast, they would have had to find a way to convince the local people to give them access to water so that they could water their fields. 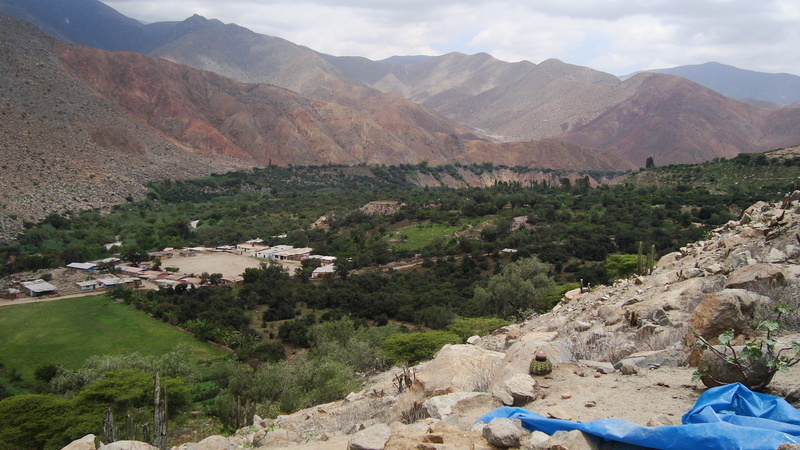 As the Huanangue Valley was relatively far away from the Chancay heartland, Chancay settlers did not have the support they needed in order to forcibly take the irrigation uptakes. However, the Chancay did have access to highly valued coastal foods such as shellfish and peanuts. During excavation, we found ample evidence of feasting at the Chancay site of Salitre. My hypothesis is that the Chancay held feasts at Salitre and invited their local chaupiyungino neighbors to these feasts. At these feasts chaupiyunginos were provided with shellfish, camelid meat and other delicacies as part of a strategy of alliance building, through which the Chancay hoped to ensure their access to water. Thus, not only did the desire for food bring the Chancay into chaupiyungino territory, forcing the two groups to face each other, but the sharing of food helped alleviate tensions between the groups, allowing them to share water and land peacefully. I am working to prove my hypothesis through analyzing soil samples taken from Chancay and chaupiyungino sites in order to better understand where crops were being grown and consumed. More information about my efforts can be found at https://www.microryza.com/projects/feasting-interaction-and-the-middle-ground-understanding-local-geopolitics-through-agricultural-production. Dillehay, Tom. 1979. Pre-Hispanic Resource Sharing in the Central Andes. Science 204(6):24-31. Murra, John. 2002. El Mundo Andino: Población, Medio Ambiente, y Economía. Fondo Editorial PUCP, Lima, Perú. Rostworowski, María. 1973. Las Etnias de Valle del Chillón. Revista del Museo Nacional. 38:250-314. Rostworowski, María. 1988. Conflicts Over Coca Fields in XVIth-Century Perú. Memoirs of the Museum of Anthropology. no 21. University of Michigan, Ann Arbor. Note from the editor: Readers will notice that the author of this post has provided a link to a Microryza web site. This is a crowdfunding web site for science research. It seems that at least some graduate students in anthropology are using this as a way to fund their research. SAFN welcomes blog postings from graduate students whose work is related to the anthropology of food and nutrition that follow this model. Such postings must, of course, follow our other guidelines (see the Blog Contributors page for more details) for contributions to the blog. An increasing number of anthropologists are turning to agriculture as a means of subsistence, a way of living in their communities, and a form of embodied research. Beyond a practice of study, this is a lived anthropology outside of academia: not a research venture bounded by funding cycles, but a journey of engagement with the world. Through their hands-on work, these ”anthronaut” farmers are transforming themselves, their communities and landscapes, and their academic work. In a recent New York Times article, political scientist James Scott said that his own farming venture has made him a better researcher; but the institutions of farming and the academy conflict and coincide in complex ways. In this interactive session, we will explore how anthropologist-farmers navigate these complexities. We welcome discussions from all theoretical and agricultural perspectives, from apiculture to Actor-Network Theory, from eco-agriculture to ethnobiology, from permaculture to political ecology. If interested, please submit an abstract (~200 words) to Ted Maclin (tmaclin@uga.edu) by March 1.